As the first half of the 2017 Korea Baseball Organization season came to an end Thursday, the Kia Tigers were sitting pretty atop the standings, having faced few challenges along the way. A wild card team last year, the Tigers now hold an eight-game lead over the second-place NC Dinos, with a record of 57-28. They swept the Dinos in the final three-game series of the first half and are entering the All-Star break this weekend on a five-game winning streak. The season resumes next Tuesday. The Tigers were tied at the top with the Dinos briefly early in the season, but haven't relinquished the top spot since April 12. They were the first KBO team to reach the 20-win, 30-win, 40-win and 50-win plateaus. In the league's 35-year history, the team that reached the 50-win mark first went on to win the pennant 73.1 percent of the time, including in each of the past five years. Their rotation is led by Hector Noesi and Yang Hyeon-jong, the KBO's best righty-lefty punch. On Tuesday, Noesi improved to the league-best 14-0 and tied the KBO record for the longest winning streak by a pitcher to start a season. Yang is second behind his teammate in victories with 13. They've both logged over 100 innings in the first half. The Tigers' potent lineup features Choi Hyoung-woo, who signed a four-year, 10 billion won ($8.79m) contract as a free agent in the offseason. After finishing runner-up in the MVP voting last year, Choi looks poised to grab the award this year, as the KBO leader in RBIs (81), doubles (24), total bases (210), walks (62), on-base percentage (.481) and slugging percentage (.689). Choi is ranked second in batting average (.374) and runs scored (72). The Tigers set a KBO record by scoring in double figures in eight consecutive games, and are leading the league with a .310 batting average and 587 runs scored, 106 more than the next team, Nexen Heroes. The Dinos, last year's runners-up, have been rock solid in second place at 48-35-1 (wins-losses-ties) , despite losing former MVP Eric Thames to the Milwaukee Brewers, and having his replacement, Xavier Scruggs, on the mend for a long stretch. Their new starting pitcher, Jeff Manship, was also sidelined for two months after starting the season 7-0, but others picked up the slack to put the Dinos in position for another run at the title. With former Kansas City Royals manager Trey Hillman at the helm, the SK Wyverns have swung their way to third place at 48-39-1. Their sluggers have gone berserk at the plate, to the tune of the league-high 153 home runs, 54 more than the Tigers and the Doosan Bears, who are tied for second in that category. 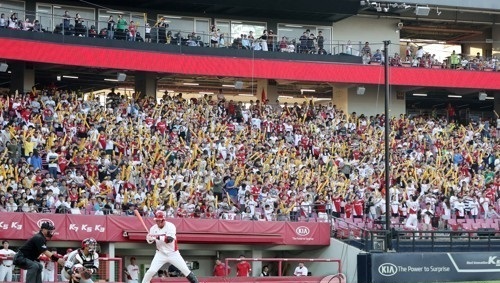 Third baseman Choi Jeong is leading the KBO with 31 home runs, and the Wyverns have five other players who have reached double figures in long balls. Teammate Han Dong-min is second overall with 26 home runs. Choi and Han have out-homered the entire LG Twins team, 57-55. And the Wyverns' pitching has held up despite missing No. 1 starter Kim Kwang-hyun, who's out for the year after an offseason elbow operation. For the second straight year, the Heroes are overachieving. They've managed to stay above .500 for most of the season, and are in fourth place at 45-40-1 despite getting no production from their one foreign hitter, Danny Dorn, and the struggles of their two import pitchers, Andy Van Hekken and Jake Brigham. 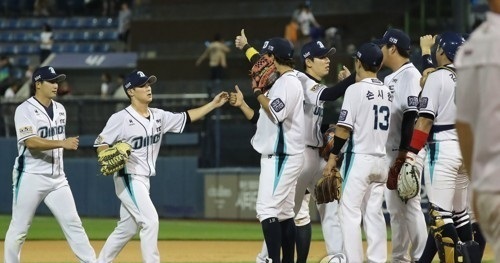 On the other hand, two-time defending champions Doosan Bears are still not out of woods at 42-39-1. Injuries to key players, such as starter Michael Bowden, catcher Yang Eui-ji and outfielder Min Byung-hun, have clearly hurt them, and the Bears got also mired in an off-field scandal this month when their former president, Kim Seung-young, was found to have given cash to an umpire prior to a postseason game in 2013. Prosecutors are looking into whether there had been any expectation of reciprocity, while Kim, who has since resigned from his position, has argued that he'd only engaged in a personal transaction with a friend. The Twins and Lotte Giants have both faded after decent starts, though they remain within striking distance of the wild card spot, currently occupied by the Bears. The Twins (41-40-1) are one game back of the Bears, and the Giants (41-44-1) are trailing Doosan by three. The Hanwha Eagles, in eighth place at 36-48-1, will likely be on the outside looking in again. They haven't been to the postseason since 2007, and the manager who was supposed to turn things around for the downtrodden franchise, Kim Sung-keun, was fired in May. The team has gone 18-23-1 under interim manager Lee Sang-kun, who will remain at the helm for the rest of the season. The Samsung Lions and the KT Wiz may well finish as the two worst teams for the second straight year. The Lions' historic run of six straight Korean Series appearances, from 2010 to 2015, already seems like a distant memory. They're now 34-51-3 in ninth place.